Intimidation Clothing is pleased to announce its continued partnership with one of Indiana’s top promotions, as the company will sponsor Colosseum Combat XXVIII on March 1 in Kokomo, Indiana. Along with sponsoring the event, Team Intimidation’s highly-visible Indiana crew will also be on hand selling its popular brand of t-shirts, hats, hoodies, fight shorts, and more. The event is easily one of the organization’s biggest in recent memory, as a pair of professional titles will be on the line in the evening’s two headlining bouts. In the main event, UFC and Bellator veteran Ryan “The Tank Engine” Thomas (19-8) will defend his Colosseum Combat welterweight title against Ohio native Chris Curtis (8-3). A member of Team Intimidation, Thomas (pictured, below) will look for his sixth win in seven outings when he faces the ultra-tough Curtis. In the co-headliner, Robert Morrow (12-15) will defend his Colosseum Combat light heavyweight title against Keith Smetana (6-3). Also sponsored on the Colosseum Combat MMA card are pro middleweight Mike Eikenberry (2-4 pro, 6-2 amateur), a 8-time Colosseum Combat vet and amateur bantamweight Justen Dowsett (11-6 amateur). Previously scheduled to be on the card is Team Intimidation featherweight Bobby Emmons (3-3 pro) who was pulled from the card with a injury. Colosseum Combat is one of the most consistent regional organizations in the Midwest, as highlights are regularly shown on AXS TV and events are routinely sold out. That’s a testament to the commitment of promoter Mark Slater, who proudly represents the Intimidation and his promotion’s other sponsors. Intimidation and Colosseum Combat MMA have worked together for nearly two years as the Intimidation brand sponsors their events and multiple fighters at most every event. The Colosseum Combat MMA event will be part of a banner night for the Intimidation brand on March 1, with events to be sponsored in Michigan, Indiana, and Ohio, along with several pro and amateur fighters sponsored at each event. Intimidation Clothing is proud to announce its sponsorship of featherweight Bobby Emmons in his upcoming featured professional bout at Colosseum Combat XXVIII on March 1 in Kokomo, Indiana. Emmons (3-3) is set to to take on veteran Luke Taylor (6-6) in a featherweight bout. Emmons dropped just his second consecutive bout in the main event at Colosseum Combat XXIV last March, when he was submitted by UFC veteran Dustin Neace in the night’s main event. A highly entertaining figure whose brash sense of humor is apparent on Twitter & Facebook, Emmons went on a 3-fight winning streak after dropping his pro debut, and is looking to start another winning streak after the losses to Antonio Castillo and Neace. Emmons, who also fights at 155lbs, will step into the Colosseum Combat cage for the third time after defeating Matthew “The Care Bear” Perry in January 2012. As part of its continued sponsorship of Colosseum Combat events, the Team Intimidation Indiana crew will be on hand selling the brand’s popular t-shirts, hats, hoodies, fight shorts, and more with an official booth. Team Intimidation welterweight and UFC/Bellator veteran Ryan “The Tank Engine” Thomas (19-8) will also be in action on the night, as he is set to put his 170-pound title on the line in the main event against “Bellator MMA: Fight Master” veteran Chris Curtis (8-3). Intimidation Clothing is pleased to announce the sponsorship of UFC and Bellator MMA veteran Ryan Thomas. Thomas (19-7), the reigning Colosseum Combat MMA Welterweight Champion, will fight for the XFC for the fourth time as he looks to remain unbeaten inside the XFC cage at XFC 27 in Muskegon, Michigan on Dec. 13. Thomas is set to face Strikeforce and Bellator veteran Dom Steele (9-4) as part of the evening’s 6-fight main card. 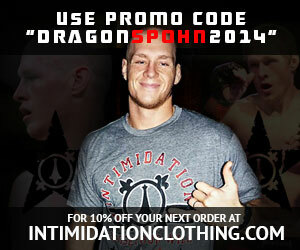 Along with sponsoring Thomas, Intimidation is also set to sponsor the XFC 27 event as well. A native of the East Central Illinois, about 3 1/2 hours south of Chicago, “The Tank Engine” wrestled in college at Division I Eastern Illinois and is a 2-time UFC veteran and has also competed 4 times under the Bellator MMA banner. A member of American Top Team, Thomas teaches at three ATT locations and has a degree in elementary education. He is currently riding a 5-fight winning streak, the finishing specialist has picked up wins over “The Ultimate Fighter” veterans John Kolosci and Corey Hill while competing for the XFC. Most recently, in his first fight sponsored by the Intimidation brand, Thomas picked up a TKO victory to win the Colosseum Combat MMA Welterweight title fight over Rocky France. Then, he defeated France once again at XFC 27 in New Mexico while again being sponsored by the Intimidation brand. In 19 career professional wins, Thomas has never made it to the judges’ scorecards stopping every opponent scoring 12 submissions and 7 KO/TKOs.